Cast iron is a pretty durable material when it comes to, say, skillets. But for gas and oil pipelines? As it turns out, not so much. Cast and wrought iron were the metals of choice for pipelines constructed in the US prior to 1940. Even after steel pipelines came into vogue during the post-War heydays of the 1950s and 1960s, cast iron was still being pressed into service in the race to build the high-demand interstate pipeline network. To suggest that those pipelines have grown old gracefully would be, well, a lie. Consider that even at its best, cast iron is kind of a cranky metal. It’s non-malleable: it can’t be bent, stretched, or hammered into shape. Because it’s brittle, cast iron can crack or break easily, sometimes as a result of ground movement in proximity to buried pipe. Fast-forward to today to find that, not only are those “mature” pipelines still in use, they’re being taxed more than ever because of the growth in shale drilling. In fact, more than half of the nation’s pipelines were constructed during the 1950s and 1960s; about 15% of American oil pipelines are even older. And approximately 3% of the gas distribution mains in service today are made of troublesome cast or wrought iron and were constructed during the first half of the 20th century. In 2011, a natural gas pipeline exploded underneath an Allentown city street. Five people who lived in the houses above the pipeline died, and the ensuing fire damaged 50 buildings. The pipeline, which was made of cast iron, dated to 1928. We can’t really blame the pipeline designers for employing the best material available at the time, although it’s doubtful that they anticipated their products would be expected to have an 80+-year life span. Even though experts say that pipeline age isn’t necessarily a threat on its own, inadequate materials plus old age can be a formula for increased danger to people and property. In short, old pipelines of cast iron and other inadequate materials might be sending us from the frying pan quite literally into the fire. More than half of America’s natural gas transmission pipelines were installed before 1970, government data show. The same holds true for pipelines that carry hazardous liquids such as gasoline, diesel, and jet fuel. Distribution mains made of cast iron or bare steel leak 18 times more natural gas than plastic pipes and 57 times more gas than protected steel. So when mid-century pipeline designers started working with bare steel instead of cast iron, they probably felt like prospectors who had hit pay dirt. Finally, they had access to a material that had none of the flaws of cast iron and even offered greater strength, flexibility, and high-pressure operating capacity. But as a transportation corridor for oil and gas, bare steel’s record hasn’t been perfect, either. When it comes in contact with moisture – either from inside the pipes or from the ground – bare steel can corrode. And corrosion in welds and couplings can lead to failures: leaks, ruptures, even explosions. In fact, corrosion has caused between 15% and 20% of the 1,400 reported pipeline incidents since 1986 that resulted in death, injury, or extensive property damage. “Newer” steel pipelines are coated to prevent corrosion and its damage. But that’s not a foolproof solution, either: Some coatings are more effective than others and the older the pipeline, the more likely it is to have been coated with something like polyethylene, a plastic that degrades over time. Since the 1970s, most pipelines have been made from medium- and high-density polyethylene. The National Transportation Safety Board (NTSB) has reported that plastic pipe installed in natural gas distribution systems from the 1960s through the early 1980s may be vulnerable to brittle-like cracking, resulting in gas leakage and potential hazards to the public. Could Better Inspection Save Lives and Property? There’s a deeply held notion in the oil and gas industry that a well-maintained pipeline should last forever – making the construction date irrelevant. But try telling that to the families of the Allentown explosion victims, or the loved ones of the eight people killed in San Bruno, CA, after a 54-year-old pipeline burst into flames in 2010, or the Arkansas homeowners whose properties were swamped by crude oil when the 70-year-old Pegasus pipeline ruptured in March 2013. And statistics, unfortunately, don’t back up this notion that proper maintenance is the cure-all. Even though pipelines remain by far the safest way to transport oil and gas, US pipeline accidents have killed more than 500 people, injured over 4000 more, and cost nearly $7 billion in property damages since 1986. Consistent rules governing pipeline inspection might add credibility to the industry’s assertion that pipeline maintenance can overcome asset age. But most of the national mandates aren’t exactly youngsters, dating to the 1960s and 1970s. And when they were created, the then-new laws didn’t apply to pipelines already built – like the ones that exploded in Allentown or San Bruno. The San Bruno pipeline, which burst along a defective seam weld, would never have passed modern high-pressure testing, but because it was installed in 1956, it was never required to. In the 1990s, reforms requiring additional testing for oil pipelines came into law. Today, the Pipeline Hazardous Material Safety Administration (PHMSA) requires operators to test pipelines in “high consequence” settings, including population centers or areas near drinking water. Rural areas often don’t qualify as population centers, so old pipelines running underground there are exempt. Even more startling is the fact that some types of pipeline, including the gathering lines that connect wells to process facilities or to larger transmission lines, aren’t regulated by PHMSA at all. Why the lack of oversight? Two reasons: the lines are operating at lower pressures, and they generally go through remote areas. But that means there are no enforced standards for pipeline strength, welds, or underground depth on the vast majority of these pipes, regardless of their age. 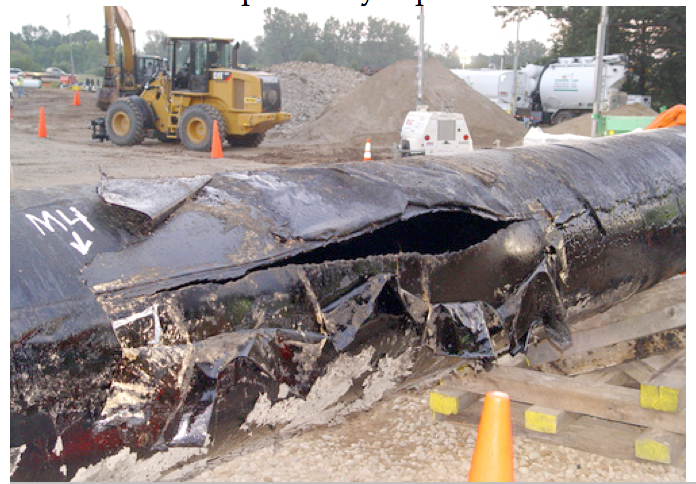 This is not to suggest that pipeline operators are shirking their safety responsibilities. Pipeline integrity is a big business for oil and gas services companies, who are pioneering new and better ways to evaluate the condition of pipelines. Thanks, in part, to newly rigorous inspection rules, spills from crude pipelines have decreased by 35% since the 1980s. But a problem with aging pipelines persists. Pipeline integrity assessment begins with a precise inventory and database to capture vital information. For pipelines installed prior to 1940, that data is often lost to time, poor record-keeping, changes in pipeline ownership, and so on. Much like buried pipelines themselves, repair data, installation dates, and even the type of base material used often remains hidden from view. Exacerbating the risks associated with old pipe is a lethal welding flaw that occurs in US pipelines built between 1930 and 1970. Although considered state-of-the-art when it was introduced, low-frequency electric resistance welded pipe (ERW) was identified as prone to seam failures as early as the 1960s and phased out a decade later when it was replaced by stronger welding techniques. ERW failure has been blamed for a 1976 pipeline blast in Whitharral, Texas, that killed a young mother and her child. In the years since, at least 200 accidents have occurred along the same kind of welded pipe, resulting in at least 14 deaths, according to PHMSA. The pipeline safety agency is working to stanch ERW-related incidents, requiring more rigorous testing of pipes in populated and environmentally sensitive areas. In addition, it has asked pipeline operators to avoid increasing pressure on older ERW pipes. Replacing ERW pipelines would stem the problem, but at a price tag of $1 million per mile, it’s unlikely that will happen. Ever. So potentially dangerous pipelines will continue to grow older, aging beyond what could reasonably be expected to be a useful life. And with each new candle on the cake, the chances that it will spark a disaster only increase. What I find particularly interesting is that the problem is so bad that now you have workers’ unions and environmental groups–two groups who are on completely opposing sides–teaming up together to lobby for repairs to these pipelines. I think that really speaks volumes to how serious the problem is right now. Like they say, everybody wins if you start fixing these old pipelines. It’s safer, puts more people to work, better for the environment, and more efficient. Are there any governmental groups looking into this problem?